My sophomore year of college was a disaster. My parents split, my grades nosedived, I changed majors twice and my great-grandmother (whom we cared for) was hospitalized a few times. 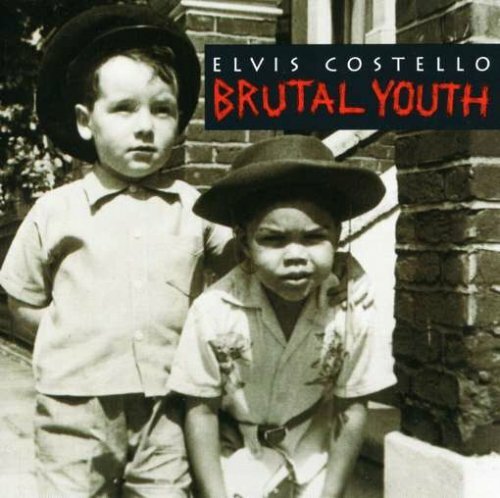 Early that school year, my friend Byron gave me a tape of Elvis Costello’s supposedly difficult and mediocre album, Brutal Youth. I found much for me to connect with in the music, but in retrospect, I can see that I got it a little backwards. At the time, I was digging deep into the discographies of my Christian rock heroes, Terry Taylor and Randy Stonehill. As a result, I initially thought Costello sounded like Taylor from an early-nineties Daniel Amos record. Now, I realize that I got it the other way around; it’s Taylor who occasionally sounded like Costello. I was also impressed at Costello’s old-timey, pre-rock songs on the album. On songs like “Favourite Hour,” his wide vibrato reminded me of my grandfather’s own canyon-wide vibrato. Basically, I hadn’t heard much like Costello’s music and attempted to fit what little I knew of his work into my small, but quickly-burgeoning, schema of musical awareness. So anyway. Lyrics are rarely the first thing to pull me into a song, but I felt a connection to Costello through his humor. I still chuckle at the chorus of “London’s Brilliant Parade” when he sings, “Just look at me, I’m having the time of my life/ Or something quite like it.” While the record may not have been an ideal introduction to his music, the lyrics are certainly indicative of Costello’s playfulness with dysfunction. He doesn’t always portray himself as the good guy, and he treats experience with jest. “I’m just about glad that I knew you once and it was more than a passing acquaintance,” he sings. Then he adds, “I’m just about glad that it was a memory that doesn’t need constant maintenance.” On (probably) my favorite song, “This is Hell,” Costello describes hell as the opposite of all good things. In the final verse, he sings, “‘My Favorite Things’ are playing again and again/ But it’s by Julie Andrews and not by John Coltrane.” I think his writing is probably an acquired taste for most, but it immediately connected with me. Between my commutes to UMKC and the hospital to see my great-grandmother, I spent a lot of time in the car that year. I remember one month in which it seemed like Brutal Youth was playing non-stop. There are so many reasons for this that don’t make sense with digital music. Sometimes only certain tapes would sound okay on my crappy car stereo, and sometimes I was so busy that I didn’t have time to grab another tape before I left the house. But more often than not, Brutal Youth just felt right, and I know that I listened to the tape 100 times in one month alone. When I started a band fifteen years ago, I chose to name it after one of the quirkier songs on the record, “My Science Fiction Twin.” Not only does the name obviously identify me as an Elvis Costello fan, but it also reminds me of that formative time in my life. I made big decisions, lost relatives and formed new relationships. Some of whom remain good friends with me to this day.